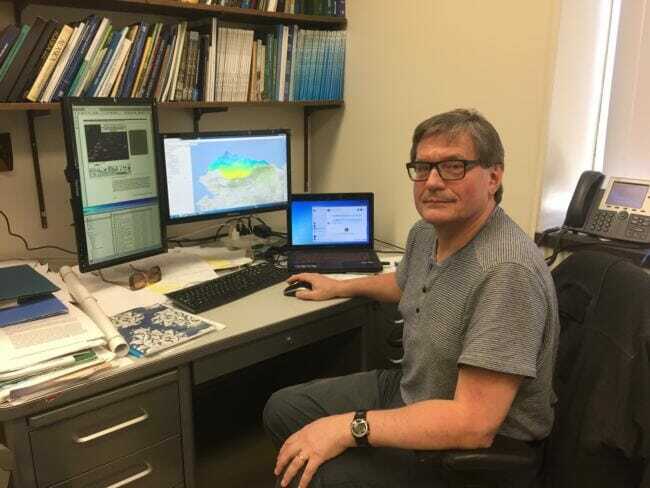 Permafrost researcher Vladimir Romanovsky, pictured in his office at the University of Alaska Fairbanks in April, 2018. On his computer screen is a new map he helped develop showing permafrost scenarios out to 2090. (Ravenna Koenig/ Alaska’s Energy Desk). All infrastructure in the Alaska Arctic — from roads to homes to the trans-Alaska pipeline — rely on stable permafrost to be functional. And it’s no secret that as the Arctic warms, that stability is being threatened. Now, researchers have put together a tool that’s designed to help visualize how thawing might play out in specific places, so they can better prepare for the future. Vladimir Romanovsky is a permafrost researcher at the Geophysical Institute and a professor at the University of Alaska Fairbanks. He’s sitting in his office looking at a map on his computer. “If you’re interested in Barrow, you can make this map kind of blow up a little bit and then see what is the situation in Barrow,” he says, zooming in. The map is almost identical to what you’d see if you looked up the North Slope on Google maps. But instead of the normal grays and greens, the whole region is lit up in vibrant colors representing ground temperatures. “We see it completely change in the colors… and now we see the temperatures are all somewhere above 0ºC, above this threshold, around +1,” Romanovsky says. No surprise — right around that freezing point is where permafrost starts to thaw. And that’s not great for the structures that rest on top of it. A few things make this map possible. One is that scientists have already mapped the ecology and geology of the North Slope in a pretty detailed way. And based on that, along with temperature data they’ve collected from 35 sites around the region, they can project how specific parts of the landscape might react to warming temperatures. “Say if you have two different conditions next to each other, we can say that in this 100 x 100 feet permafrost will behave this way, and next to it, it could behave differently,” Romanovsky said. In addition to the two different climate scenarios, you can also see how adding gravel, say for a road, or seeing an increase in vegetation might change the temperature of the ground. Romanovsky emphasizes that the map is not a prediction. Instead, it’s simply a projection of how a few scenarios might play out, based on different assumptions. “We hope that this tool will be useful for engineers who [are] doing some projects in this area, for government thinking about what they should expect, and also for any people who live in Alaska,” Romanovsky said. 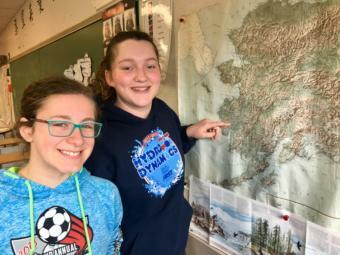 He says that the North Slope is just the first region they’ve made a map for. Eventually, they’d like to make others for permafrost throughout the state. The project was paid for by the Alaska Climate Science Center at the U.S. Geological Survey. It will be available to the public in a few weeks.